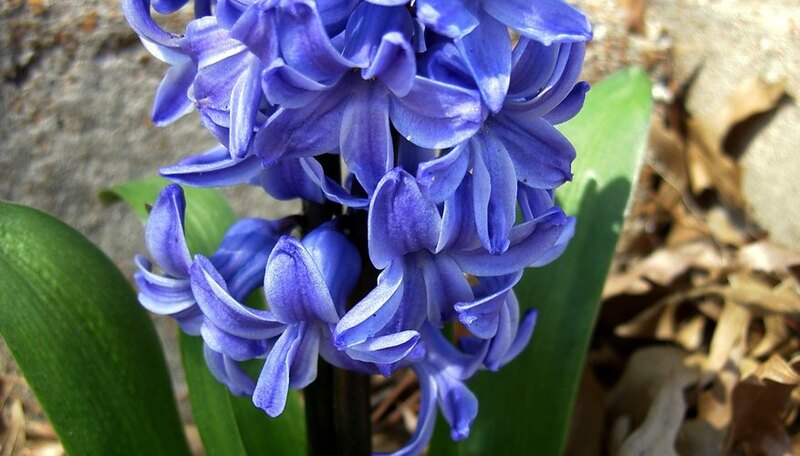 Hyacinths are one of the spring flowers that are often forced into bloom early. It is a welcome flower, signaling the beginning of another growing season, and many stores sell magnificent hyacinths in bloom with fragrance that fills a whole room. Unfortunately, the bloom fades after a few weeks, and you are left with a yellowed stem that you might be tempted to just throw away. Instead, save it to add to your perennial garden. Take the spent hyacinth outside to plant in your perennial garden. If you care for it properly, allowing the leaves to grow after the blossom has passed, it will bloom again year after year. Since potted hyacinths are usually in a nutrient-poor soil, carefully remove it from the pot and shake the soil loose. It is often mostly fibrous, which will be good for your flower bed. Dig a hole at least 10 inches deep and even deeper if you have a long root mass falling off the hyacinth bulb. Work the soil so it is loose and add some well-aged compost for extra nutrients. The bulb should be buried completely, or it will heave up with the first hard frost and then rot. Set the hyacinth plant into the hole carefully and fill in the dirt around it. Keep it positioned so that the root is down and the leaves are straight up, with about six inches of dirt over the bulb. Tamp the soil around the bulb and then water lightly. Allow the leaves to grow for the rest of the summer until they wither or until it wilts with the first frost. Mulch the bed heavily in the fall to protect the bulbs from winter damage if you have cold winters. When the following spring arrives, you should see the leaves sprouting up and fresh blossoms forming. Encourage your hyacinth bulbs to produce new bulbs by scoring them. According to the Colorado State University Cooperative Extension, there are several ways of doing this: One is by simply cutting some wedges out of the base of the bulb or scoring it before planting it in a sandy soil. This will encourage the plant to produce little side bulblets that can be replanted beside the mother bulb. They will require a few years of growth before they will be large enough for flowering. Don't over-water your bulbs or they will rot.